Katie is from Grand Rapids, MI and has been playing lacrosse for 10 years. She loves lacrosse because it is fun and demanding. 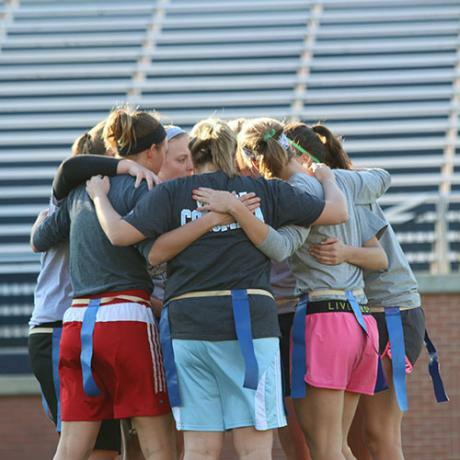 Lacrosse has taught Katie teamwork, leadership, and brought her so many friendships. A goal of Katie’s for next season is to have more team bonding events. The bulldogs suffered 2 loses at their Sunday tournament at IU on April 7th. In their game against West Virginia they were only down by 2 at the end of the first half with a score of 4-6, but ran out of steam in the second half, and West Virginia pulled away. In their game against IU the bulldogs once again were only down by a few goals at the end of the first half, and at the start of the second half IU continued to pull further away. Overall, the bulldogs had a fun time in between games with a potluck picnic with their family and friends. Also, they were able to avoid the thunderstorms and had great weather for playing lacrosse. Thank you for everyone who came out to cheer us on! We will use these past 2 games to learn so that we can beat Xavier in our final game of the season! GO DAWGS! Thank you Madison for trying something new, and we are so excited to see your skills continue to grow! Your lacrosse dawgs have kept their perfect season record by bringing home another win against Taylor University with a score of 14-6. The first 10 minutes of the first half was a close game with the score being 3-2 (Butler), however the bulldogs were able to pull away for the rest of the game. As a whole team the bulldogs controlled the midfield, with 10 draw controls and 17 ground ball controls. Great work dawgs and thank you Taylor! This weekend we brought home the W from Rose-Hulman University to kick off the spring season with a score of 18-7! Our record is now 2-0, go dawgs! Statistics were not taken for this game due to the fact that the entire team was on the field at all times, but will be updated from here on. Check out our upcoming game schedule, and come support your fellow bulldogs to help them continue to bring more wins back to Butler. Sarah has been selected the women’s club lacrosse team’s player of the month for February due to her perfect attendance since our spring season kick off. Sarah is a first year Communication Science and Disorders major. She has been playing lacrosse for 4 years because a friend of her’s in high school encouraged her to pick up the sport and she “instantly fell in love with the game”. One of the main reasons Sarah loves lacrosse is because, “it is so high energy and everyone of the team had role, both on and off the field”. Her favorite memory so far of this spring season was our spontaneous team bonding at Buffalo Wild Wings. For the rest of the season Sarah is, “excited to see us grow as a team and to really kick off the spring season”. Thank you so much Sarah for your dedication to this team! Tomorrow is Butler University’s Day of Giving. This is an event where the whole university raises money to celebrate and support all different areas of campus. The event begins 2/27 at 6:00 AM and ends 2/28 at 12:55 PM. We have an exciting year planned and we are asking for donations to help offset our general expenses. To keep the team progressing each season requires a significant budget that cannot be met by University funds and student dues alone. We depend on individuals as well as businesses in the community to support our team in order for us to continue to not only compete but also represent Butler University. Our expenses for the season consists of travel to and from tournaments, ref and field time fees, as well as some new equipment and uniforms that we currently lack. Our goal is to acquire sufficient funds from donors and or sponsors to strengthen the foundation of our team and to ensure the future success of the program. Given that we are a non-profit organization, your donation is tax-deductible and serves as an excellent way to give back to your community. We graciously accept any assistance you can offer, and we thank you in advance for your support for our club and our University. Donors will be presented with a letter of thanks as well as an acknowledgement certificate for your tax-deductible donation. You can click the “Giving” tab at the top of this website to find instructions on how to donate, and be sure to specify that the donation is for “Women’s Club Lacrosse” Thank you for your consideration. The executives are excited to have Kendall join their team because of how dedicated she is to the team, and we are excited to see the new and creative ways that she will promote the team. 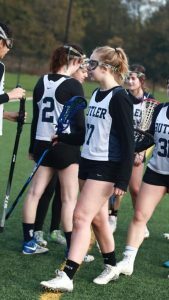 Kendall will be taking over the club’s Instagram (@butlerwclublax) and Twitter (@BUWClubLacrosse) accounts as one of her main responsibilities, so make sure you go and follow them to see Kendall’s work this season. I am excited to announce some of the big things that are happening in women’s club lacrosse as we begin a new spring season. First of all, we now have 22 members on our roster. This is a large growth from last semester, and an even larger growth from last year. How exciting! Additionally, we officially have 4 games on our schedule throughout February and March, and hopefully we will be adding a home tournament sometime in April, so stay tuned for that. But the most exciting piece of news is that we added a new executive position for the club: Marketing Chair. We will be holding elections throughout the next week and will be posting the results promptly after. The new position entails managing the club Twitter and Instagram accounts, attending executive meetings, and designing official schedule posters. All the current executive members are excited to have another hand to help out behind the scenes. Also, we will be continuing player of the month so stay on the lookout for those posts to cheer on our members for their accomplishments. That’s all for now. And as always, GO DAWGS! Kendall is a first year Healthcare and Business major who has been playing lacrosse since kindergarten. She has been awarded player of the month for November because of her commitment to the team, performance at the scrimmage against the BU boys club lacrosse team, and for always bringing her positive attitude! 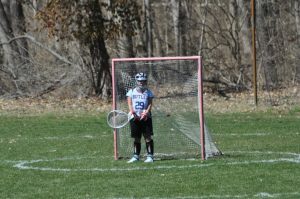 She started playing lacrosse because her family encouraged her to play another team sport. Kendall loves the sport because, “lacrosse has given me so many memorable times, friendships, and opportunities. I love working towards a common goal with my teammates and coaches. It has allowed me to grow as a leader, and I’m so thankful to have had the game in my life for so long”. In the scrimmage against the boys Kendall thought it, “was fun and a good bonding experience. I think [the boys] learned a little more about girls lacrosse and it’s always nice to get a win”. One thing that Kendall is looking forward too for the upcoming spring season is to grow closer to the team and continue to get wins as we face stronger teams. Thank you Kendall for always being a positive and encouraging member of this team! We cannot wait to see the great things you accomplish this upcoming year. UPDATE: Our tournament at IU this Sunday (4/7) has been changed. We will now be playing West Virginia University at 10 AM and Indiana University at 1 PM. Go dawgs! 3 weeks ago by butlerwclublax UPDATED SCHEDULE The time for our game against IU on April 7th is now 2:30 PM. Additionally, we will now be playing Xavier on April 27th at 10 AM. Go dawgs! 2 weeks ago by butlerwclublax After a 14-6 win over Taylor two weeks ago, we’re ready to take on WVU and IU today! 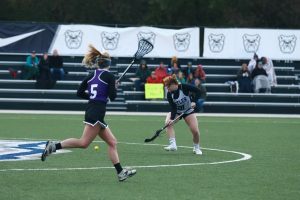 2 months ago by butlerwclublax HAPPY GAME DAY The Dawgs will head to West Lafayette to play Purdue at 6:30 P.M. in the Turf Recreation Exercise Center (TREC). We hope to see you there! Special thank you to @jjlii30 for the pictures from our fall ball game against Taylor! UPDATE: Due the miscommunication, the game has been cancelled. 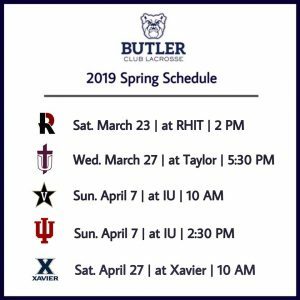 The first game of the season for @butlerwclublax will now be against Rose Hulman on 3/23.